A large late Victorian mahogany ornate overmantle mirror with bevelled glass. Has 2 shelves on either side. 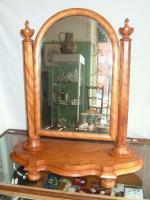 A large mahogany mirror C1890 typical of the Art Nouveau era. 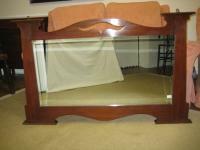 With beveled glass in excellent condition. 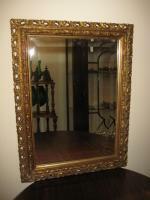 A large rectangular oak wall mirror C1900 with bevelled mirror. A very simple, clean design. Can be hung either way. 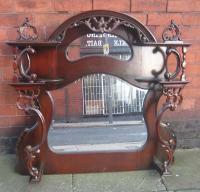 Walnut gothic style Victorian dressing table mirror in fantastic condition. C1900. Stands on its orignal turned bun shaped feet. An ornate large wall mirror made up of small and large mirror plaques with bevelled edges. Art Deco in style. 1920s deco mirror with wood effect in certain areas. Nice original bevelled glass. 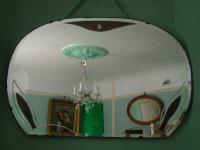 Oak 1930s overmantle mirror with original bevelled mirror. Carved panels to each side of the mirror and releif work to the top.